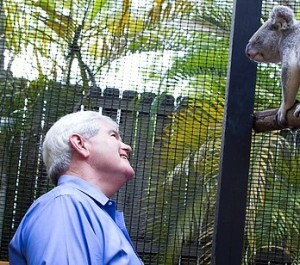 Newt Gingrich meets a koala. In 1995, the Endangered Species Act was in deep political trouble. The House of Representatives was considering a bill that would cut sixteeen million dollars from the endangered species activities of the Fish and Wildlife Service and completely abolish the National Biological Service. The speaker of the house, Newt Gingrich, was saying that it made little sense to spend money on species protection because extinction is just “the way life is.” A group of concerned scientists arranged to meet with Gingrich, wishing they could mitigate this potential disaster by reasoning with him about the value of these endangered plants and animals. We scientists often like to think that logic and a solid argument out to carry the day. If only it were that simple. If only reason alone sufficed to change people’s minds and spread the good word about science. And if only, decades later, scientists weren’t still suffering from lack of support for their causes and for their research. On the contrary, times seem to have gotten harder for science in the United States since 1995. University endowments in the U.S. plunged an average of 18 percent in 2009, leading to widespread furloughing and the shuttering of whole departments. The House of Representatives passed flat budgets for the major federal science-funding agencies in 2011. The economic pressures our country is facing extend to the lives of graduate students and postdoctoral fellows, who are facing dim job prospects. And never mind trying to save our country from the current tide of ignorance—simply trying to forge a career in science has long been a mys- tifying endeavor. Rejection rates for papers submitted to scientific journals are often 70 to 80 percent. NSF funding rates for new investigators are typically less than 15 percent. For decades, applicants for tenure-track positions have often numbered in the hundreds. How are we meant to cope with these odds? Like many scientists, I’ve long worried about these problems. But now I’ve found a tool that I think can help us deal with most of them, maybe all of them. This tool can help us succeed in science or in academia, or launch an alternative career. It can help us find jobs, win grants, attract students, get tenure, communicate to the public, or promote science to Congress. It can give us the perspective we need in order to adapt our- selves to difficult times. Tom Eisner brought to the meeting a small vial that had a little cutting from an endangered mint plant in Florida that Eisner felt might harbor some interesting [compounds that could be used as] new insecticides and pesticides, and presented it to Gingrich. Gingrich was intrigued and asked if he could keep the vial! Then, ultimately, Gingrich told the scientists that he would make sure that he would not let the ESA be gutted. Instead of walking into Gingrich’s office looking to argue, Eisner walked in eager to start a conversation. His prop—the mint plant cutting— broke the ice and gave him an opening that led to two more meetings with Gingrich. During those meetings, he forged a new relationship that in turn helped shape U.S. ecological policy for the better. Gingrich made good on his promise. He gave a speech where he em- braced the “values and goals” of the environmental movement. Later on, when a bill that would have undermined the ESA cleared the house re- sources committee, Gingrich did not let the bill come to the floor for a vote. The heart of Eisner’s approach—starting a conversation, building a relationship—might be called many things: advocacy, education, or salesmanship. Whatever you call it, it seems to me that scientists of every kind need to learn more about it. The word I prefer to use may make some of us uncomfortable, but now is not the time to be squeamish. That word is marketing. Excerpt from Marketing for Scientists, by Marc J. Kuchner, Published by Island Press.